Because of this, you fled from the praise and honors of the world, and were rewarded with the grace of preserving your heart from all sin and persevering in a holy life until old age. On my part, I have through pride, self-confidence, and negligence, yielded to my evil inclinations, and through this sinned grievously and often, offending my God and Lord, my Creator and Redeemer, my most loving Father. Therefore I implore you to help me through your mighty intercession to be enlightened by the Holy Spirit, that I may know the malice, grievousness, and multitude of my sins. Grant that I may confess them humbly, fully, and contritely, and receive pardon, tranquillity of heart, and peace of conscience from God. Amen. My Lord and my God! I offer up to You my petition in union with the bitter passion and death of Jesus Christ, Your Son, together with the merits of His Immaculate and Blessed Mother, Mary ever Virgin, and of all the Saints, particularly with those of the Holy Helper, St. Giles, in whose honor I make this prayer. Look down upon me, merciful Lord! Grant me Your Grace and Your Love, and graciously hear my prayer. Amen. St. Giles became one of the most popular saints in the West, the patron saint of woodland, of lepers, beggars, cripples, and of those struck by sudden misery, and driven into solitude like the hind, which, according to one tradition, came to St. Giles wounded. 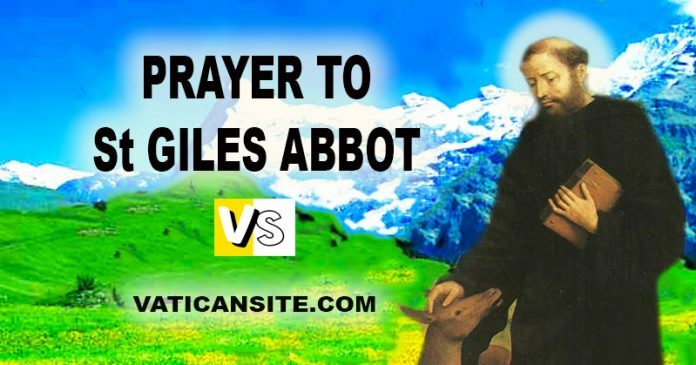 He is also the patron saint of over one hundred and fifty churches in the United Kingdom, (though not to be confused with another abbot of the same name, who was in the same province two hundred years earlier). Our church’s original foundation in 1101 fittingly took his patronage, for it was a Leper hospital and chapel named after St Giles, and provided succour for all those alienated from their community. In the Prayer Book he is described as “St. Giles, Abbot and Confessor”, and he is commemorated on September 1st.